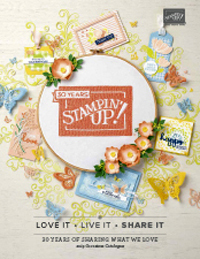 The more I use the Garden Whimsy stamp set, the more I like it. Here, I have used it in combination with one of the new sets called Pocket Silhouettes, and also some of the beautiful new designer series papers. In case you hadn’t noticed, I am really loving faux stitching at the moment, so you will find it on a lot of my cards and scrap pages, including this one 🙂 And if you would like to learn this easy but effective technique, just contact me about my upcoming classes. 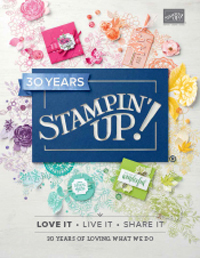 Stamp Sets: Garden Whimsy, Pocket Silhouettes. Cardstock: Old Olive Textured, Bashful Blue, Whisper White, Raspberry Tart Designer Series Papers. Inks: Rose Red, Cameo Coral, Old Olive. Accessories: Markers, Paper piercing tool and Mat, White Gel Pen, Paper Snips, Bashful Blue 2.5cm Double Stitched Grosgrain Ribbon, White ribbon from Dress Up Ribbon Originals.